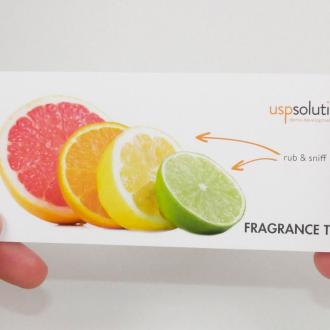 USP Solutions’ Body Fragrance Test is a reliable, easy-to-use test that appeals to your consumer’s senses – enabling them to touch, feel and “smell” your brand, thus emotionally engaging them. 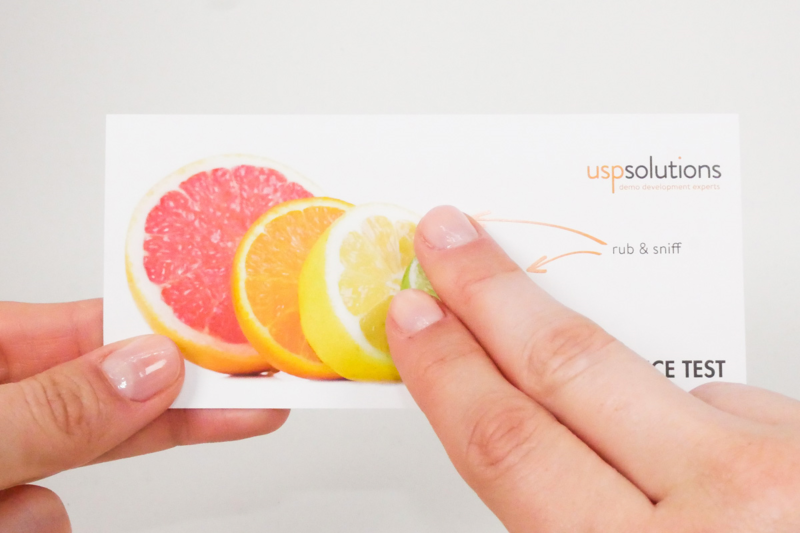 The scent is revealed by gently rubbing the card against your body skin, eg. the inside of your forearm. When consumers perform the test, they get physically in-touch with your brand. It’s this haptic experience that creates an emotional and long-lasting impression – essential when it comes to brand awareness and brand love. Consumers are often uncertain to try out new body lotions, shower creams, or deos because they simply don’t know its scent. And even more so, they are uncertain how this scent unfolds on their very own skin. How do you as a Marketing Executive re-assure that buying your brand is the right decision. How to ensure people choose the scent they love, and, as a consequence will stop trying but buy again? 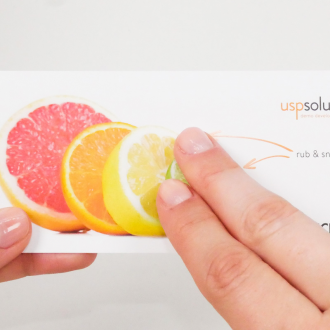 provide consumers with their brand’s unique scent before a buying decision is made. offering unique demo tools which emotionally engage consumers and increase word-of-mouth. online and offline. Consumers often feel overwhelmed by what is offered in stores and online. Unable to test a product’s scent before their purchase, most consumers stick with the brand they know. How does this product’s scent unfold on my skin? What is the scent like, how intense is it? What if I don’t like the smell? I don’t want to take any risk. it engages consumers. online and offline. and creates brand awareness. it creates a sensory experience, and therefore a long-lasting memory. 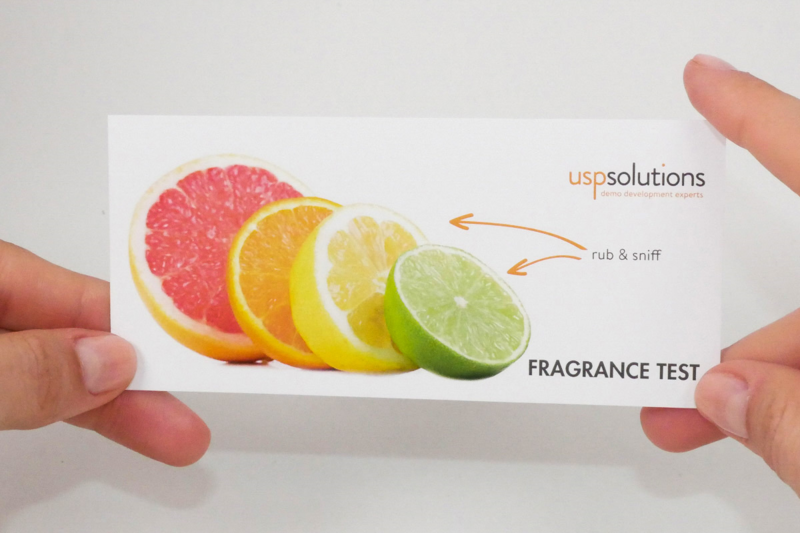 it enables consumers to detect how your product’s scent unfolds on their very own skin, thus increasing their purchase intent. 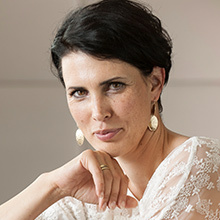 The fragrance demo tool enables your cosmetics brand to design an emotionally engaging and tailor-made “Beauty Moment of Truth”. Place the Body Fragrance Test in front of you. 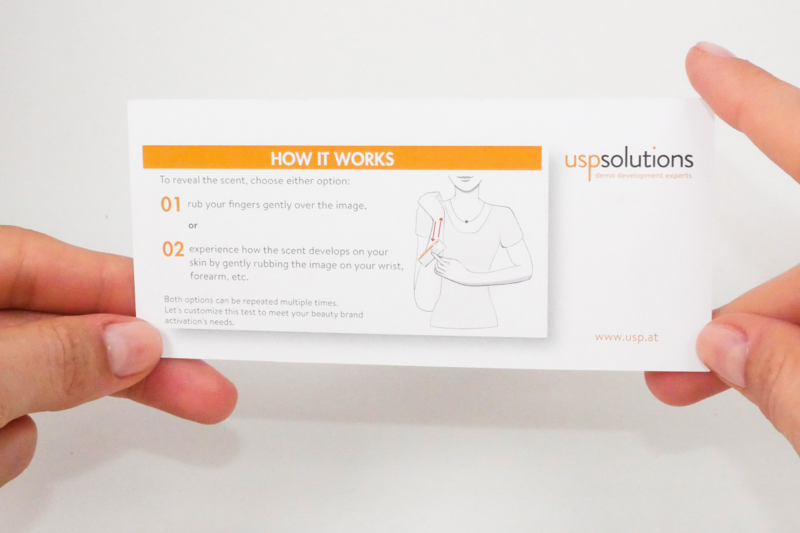 We can easily customize the Body Fragrance Test and adjust size, shape, material, printing effects and more – so the tool perfectly reflects the uniqueness of your brand.